As the dust settles in Gaza, the rebuilding begins again. This vicious cycle is one that the Palestinians living in the tiny coastal enclave know all too well. Fighting erupts, and next thing you know, besieged Gazans are holed up in their homes as bombs fall indiscriminately around them. Nowhere is safe and there is nowhere to go as the borders are sealed and the artillery is coming from every direction. All people can do is sit and wait in fear. The difference between Gaza and anywhere else in the world though, is the resilience that the people face all of this with. Somehow once the tense calm is restored, Palestinians in Gaza begin to carry on with their lives amidst the rubble and under the specter of death. 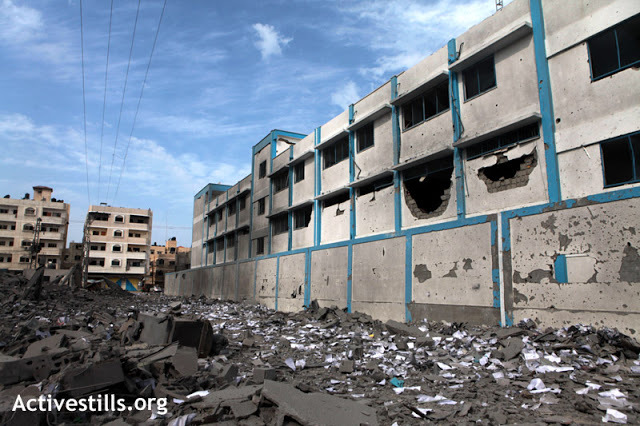 Being under siege, “rebuilding” is a relative term in Gaza. Just as we began to see construction actually taking place in the past two years after the last bombardment – Cast Lead in 2008/09 – much of what was rebuilt, was destroyed again. For Palestinians living there, because of the constant conflict and the inability to bring materials into the Strip due to Israeli siege, rebuilding has taken on a different meaning. It means showing their resilience to the world and their ability to continuously move forward despite being pushed back repeatedly. Flying Paper tells part of that very story…of hope and resilience and creative resistance despite the constant struggle of life under a political nightmare that never seems to end. The children in Gaza greet each day with a smile, and power through their post-traumatic stress with more strength than one could possibly imagine. Given what the children face on a constant basis and some, having now watched home destroyed twice in their short lifetimes, it is simply amazing that they are able to continue on with grand dreams – like breaking the Guinness World Record for kite flying. Their stories told in Flying Paper are not without grief and hardship, but they are unique in how they face each and every obstacle in their lives. For those of us who have been fortunate to encounter this first hand on the ground, you come away from Gaza feeling grateful for all you have – not just material possessions, but simple things like freedom of movement and rights – and feeling inspired by the incredible people you meet. Gaza is not entirely poverty stricken, but it is the lack of freedom and the constant pressure of living under siege that truly makes life so extremely difficult. That is why the resilience and hope that still exudes are an integral part of the “rebuilding” every time Gaza is at the brunt of an Israeli onslaught. As we all watched “Operation Pillar of Cloud/Defense” over the last few weeks, those of us directly tied to this film, its characters, and the Palestinians in Gaza behind the scenes, waited with bated breath, hoping and praying that no news was good news. For us and for anyone else who has seen Flying Paper or encountered the Palestinian struggle in another form, the most difficult part is sitting on the sidelines not knowing what to do or how we can help. Our general support and solidarity is a huge first step. Support of this film and other public education projects around the world, ensure that as Gaza is being bombed, the world is watching and the voices of Palestinians there are not being silenced. ..that their stories are told…and told by them. We need to be sure that our efforts go further than this, though, and there are many ways in which we all can take action and help the rebuilding of Gaza once again. Below you will find organizations doing work, immediately, on the ground in Gaza, to lend a hand to all of those affected by the violence, be it material aid, a refuge after a home was destroyed, or counseling and support for those traumatized by what they have witnessed. At a time like this, we thank you for your support of the film, and encourage you take it one step further and assist these incredible organizations as they help children and families like those you have seen and will see in Flying Paper, rebuild again. The organizations listed below are a few of the outstanding groups doing work on the ground in Gaza and running emergency appeals. You can donate directly to them, or if you would like to contribute to Flying Paper and one of these groups as well, we are happy to accept donations online through our supporting nonprofit, Fractured Atlas, with 75% of the proceeds going to support emergency relief work through these organizations. 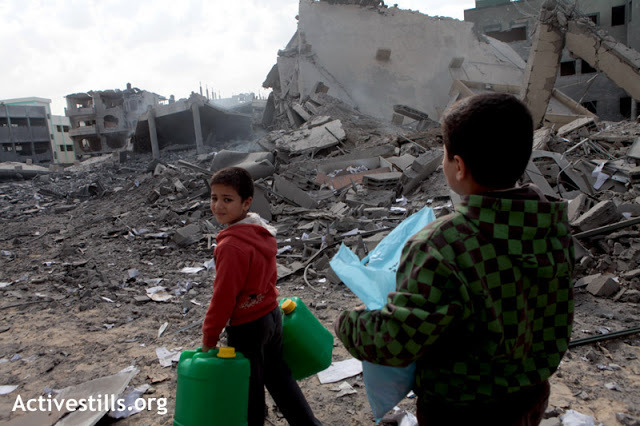 Playgrounds for Palestine (PfP) – A great deal of work and effort goes into building these playgrounds. Playgrounds that are purchased abroad are shipped and assembled using local labor. We transfer “ownership” of the equipment to a local Palestinian NGO or municipality that takes over the responsibility of maintaining the playground and providing access to all children. The land is always donated. In nearly every aspect of operations in Palestine, we rely on the generosity and dedication of ANERA (American Near East Refugee Aid) to help us ship the equipment, transport it on the ground, liaise with local organizations and local communities to install the playgrounds. Palestine Children’s Relief Fund (PCRF) – The Palestine Children’s Relief Fund is a registered non-political, non-profit, 501(c)3 tax-exempt organization that was established in 1991 by concerned people in the U.S. to address the medical and humanitarian crisis facing Palestinian youths in the Middle East. It has since expanded to help suffering children from other Middle Eastern nations like Iraq, based only on their medical needs. The P.C.R.F. helps to locate free medical care for children from the Middle East who are unable to get the necessary and specialized treatment in their homeland. Middle East Children’s Alliance (MECA) – The Middle East Children’s Alliance (MECA) is a non-profit organization working for the rights of children in the Middle East by sending humanitarian aid, supporting projects for children and educating North American and international communities about the effects of the US foreign policy on children in the region. American Friends of UNRWA – American Friends of UNRWA, Inc. is a non-profit organization that supports the work of the United Nations Relief and Works Agency for Palestine Refugees in the Near East (UNRWA), which provides support to the over 1 million Palestinian refugees in Gaza. United Palestinian Appeal (UPA) – United Palestinian Appeal, Inc. works to alleviate the suffering of Palestinians, particularly those in the West Bank, Gaza and the refugee camps of Lebanon, and to contribute to the long-term socio-economic and cultural development of Palestinian society. We will continue to add links to other such worthy organizations doing relief work in Gaza; if you have suggestions please let us know.